Secret of Mana has always been unconventional. The 1993 original differentiated itself from popular role-playing games like Legend of Zelda or Final Fantasy and created its own mishmash of distinct features. I didn’t come across Secret of Mana until adulthood, and when I finally sat down to watch a playthrough, its kookiness surprised me: The audacity of a three-person multiplayer game shocked me, the stamina bar created stop-and-go action I’d never really experienced, and the constant need to open a menu for magic seemed convoluted. I never quite understood the game’s appeal, until I started playing the recently released remake. While it certainly shares a lot of idiosyncrasies with the original, it’s the new peculiars of the remake that has helped me realize how great that weirdness really is. The remake hasn’t really won critics over. For some, the new game doesn’t possess the same charm that made the original so special. Remaking a game, especially one so highly regarded as Secret of Mana will always come with some disappointment. What is lost when a remake changes a 2D game into 3D? What are we missing when new features replace old ones, or when old features go completely untouched? I think this remake is a great complement to the original. It steers a little off the original’s course, but that just makes it a much more interesting remake. 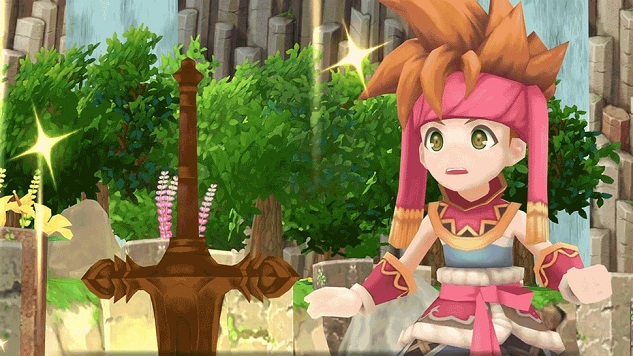 It’s clearly Secret of Mana, but the specific changes to the game gives this remake its own identity that proves not every remake needs to be completely faithful to its source. The biggest example is its new 3D graphics. Side by side comparisons show that the new graphics place every rock, tree and building nearly in the same place as the original. But I wouldn’t say the new visuals are an improved or enhanced version. The characters look a bit like bobble heads that often collide with each other. Everything is voice acted, but character lips don’t move along with the voices. The building and enemies look adorably fake and childlike, which feels fitting for the three young heroes. I’m completely fine with all of this. Certainly, there’s something nice when an old game is polished and placed on modern consoles. The Legend of Zelda remakes, Ocarina of Time for the 3DS and Wind Waker for the Wii U, are great examples of older titles that received minor enhancements to their graphics and gameplay to create a game that is incredibly similar to the original, but with a little fine tuning. The Secret of Mana remake, however, doesn’t care much about fine tuning; in fact, it leans heavily into the dated aspects of the original. The game itself looks and plays like it’s from the previous generation of consoles, though I think that blend of new and old is what makes the remake so interesting . This remake, like any other, has to contend with the contemporary context in gaming. What was revolutionary on the Super Nintendo isn’t as extraordinary on today’s consoles. Multiplayer games are extremely common. Role-playing games are abundant. This remake couldn’t push console limitations the same way the original did, so instead it embraces the offbeat, much like the original did at the time. This doesn’t completely absolve the remake from its bugs and glitches. The game is susceptible to crashes. I’ve also come across a few bugs that were easily fixed by resetting the game. They’re easy fixes, but also frustrating the more often they occur. I appreciate a game that isn’t afraid to be a little ugly, but it must also be polished enough to prevent game crashes. One pitfall people often fall into is the idea that a remake is meant to be the superior version of a piece of work. A remake literally means a piece of work that’s been remade again. In an IGN interview with the game’s producer, Masaru Oyamada, Oyamada emphasized a desire to create a new sort of accessibility for new players. The remake had to be close enough to the original for older players to “be able to relive the experience and the fun that they had back then playing the original game,” while also being modern enough to align with the desires of newer players who are not familiar with the Super Nintendo classic. The Secret of Mana remake doesn’t feel like an improvement, but I don’t think it’s meant to be one. Its primary focus is reimagining the weirdness of the original, and that’s also its greatest strength. Sure, there were changes to cater to a younger audience who apparently prefer 3D graphics and voice acting, but I think the main point of this remake is to retell an eccentric old story with a whole new set of eccentricities. I don’t mind a remake that’s a little rough because the original was a flawed game, and Secret of Mana reminds us that flaws aren’t always such a bad thing, anyway.